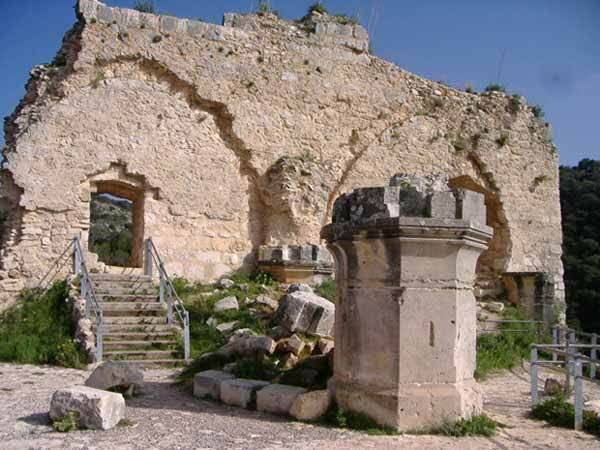 During August–September 2011, excavations were conducted at Montfort Castle, the principal castle of the Teutonic order located in the western Galilee (License No. G-72/2011; map ref. 22170/77240). 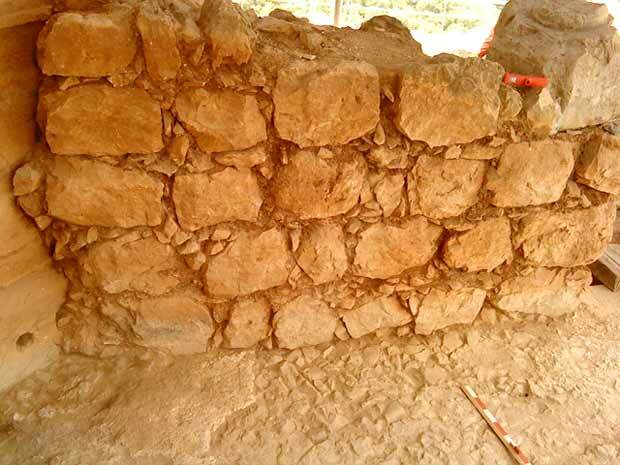 This first season of excavations by the Monfort Castle Project (MCP) was carried out on behalf of the Zinman Institute of Archaeology at the University of Haifa and the Society for the Study of the Crusades and the Latin East (SSCLE). The excavation was directed by A.J. Boas (field photography), with the assistance of S. Khamissy (surveying and drafting), R. Khamissy and R. Lewis (assistance and field photography) and a small team of students and volunteers. 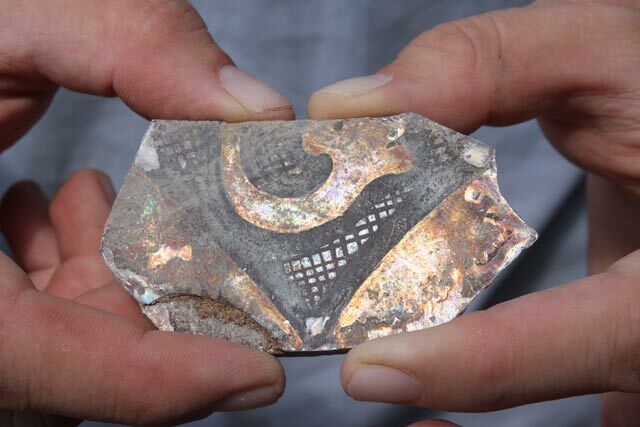 This is the first large-scale archaeological excavation at the Montfort Castle since the 1926 expedition of the Metropolitan Museum of Art, New York. The first season focused on what had apparently been the ceremonial hall of the castle at the western end of the main complex, to the west of a high wall between the central domestic wing and the hall; this was designated Area A (Fig. 1; Boas, A.J. 2006. Archaeology of the Military Orders. London-New York, p. 128, Fig. 39). A second area (B) was designated within and adjacent to the outer fortification wall on the northern slope below the castle, and a path was partly cleared for future work there (Fig. 2). The ceremonial hall or “Great Hall” was located on the western end of the castle where the steep topography required the construction of a platform, formed of two pointed barrel vaults, which enabled the hall to be on the same level as the ground floor of the domestic wing. The aim of the excavation was to examine the collapsed vaulting and architectural elements and to expose the original floor on the eastern side of the hall, which had remained buried under debris from the dismantling of the castle by the Mamluks in 1271. Exposure of the buried remain was expected to enable a better understanding of the nature of the Gothic rib-vaulted hall and to provide evidence substantiating the existence of another story above the hall. 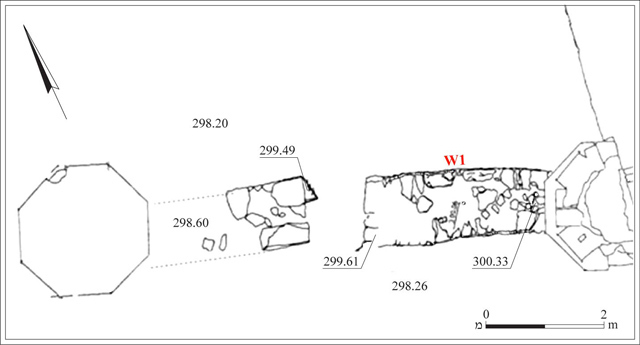 The excavations exposed a large number of finely cut limestone ashlars, mainly vault ribs with diagonal chamfers that were of two sizes: the larger ribs (20–44×52–62 cm) and the smaller ribs (23–30×26–33.0/37.5 cm). 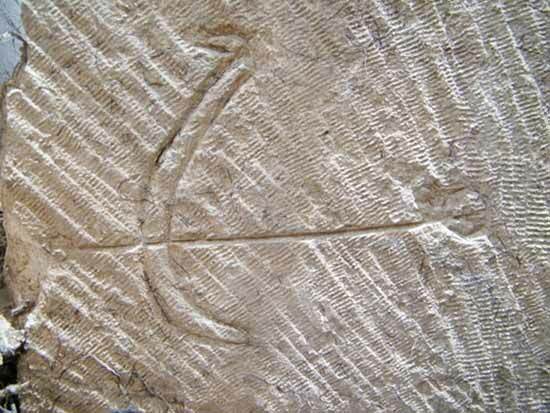 Many of these display masons' marks, including a fine example in the form of an arbalest (Fig. 3), and the smaller ribs generally display remnants of mustard-colored paint. Large fragments of gray plaster were recovered, probably originating in the vaulting, and fragments of pale pink plaster set within small to medium-sized wadi pebbles, were apparently fragments of a floor. The removal of the collapsed debris entirely exposed two large pilasters on the eastern wall, identical to the free-standing octagonal pier at the centre of the hall. Only the upper portion of these pilasters near the springing of the vault ribs could be observed prior to excavations. In addition, a broad wall (W1; width 1.2 m; Figs. 4, 5) was exposed, crossing the hall west to the central pier. This wall, built in dry construction of large roughly shaped fieldstones, stone chips and terra rossa, was preserved five courses high (2 m). Close to its center, an opening is located directly above a light shaft, opening into the basement vault below. The floor of the hall consisted of a stone foundation covered with a layer of white plaster. However, most of the plaster is missing. On this floor below the debris were a few concentrations of charcoal and by one of these, to the north of W1, were the remains of a thirteenth-century glazed cooking pot and a large number of bones mainly pig. Following the excavations, a large monolith lying on W1 was overturned and examined. It forms the base of half of a pier with three round pilasters. The excavations have answered architectural issues and have thrown light on the appearance and function of this part of the castle and on events in the final years of Montfort prior to its destruction. Firstly, together with finds made but not entirely understood by the American expedition of 1926, it now is clearly established that this wing of the castle consisted of three stories: the basement consisting of two barrel vaults, the Great Hall with its octagonal pier and pilasters and large ribs, as well as two large keystones, one found in 1926 and the second one still remaining where it fell on W1, and an upper, third story with painted Gothic vaulting. Finds from the upper story, other than the above-mentioned pier base, included the smaller painted ribs, a section of a pilaster, one of the bossed keystones found in 1926, stained glass found in 1926 and some fine pieces found during this season (Fig. 6) and fragments of plaster from the ceiling, walls and floor. Secondly, the dividing W1 has been securely dated to the time before the destruction of the castle in 1271, but after what would appear to be a catastrophic event that caused major damage to the structure and probably to the entire castle. On the one hand, Wall 1 was constructed on the already destroyed floor of the hall and onto the already damaged central pilaster on the east wall, whereas, on the other hand, it is buried beneath the collapse of the vaulting of the great hall and debris from the floor above. Wall 1 and similar strengthening and subdividing elements in the central wing of the castle may therefore be assigned to reconstruction and renovation work, carried out after major damage caused either by the earthquake that occurred in 1259 or alternatively by the first siege of the Mamluk army that took place in 1266. 1. 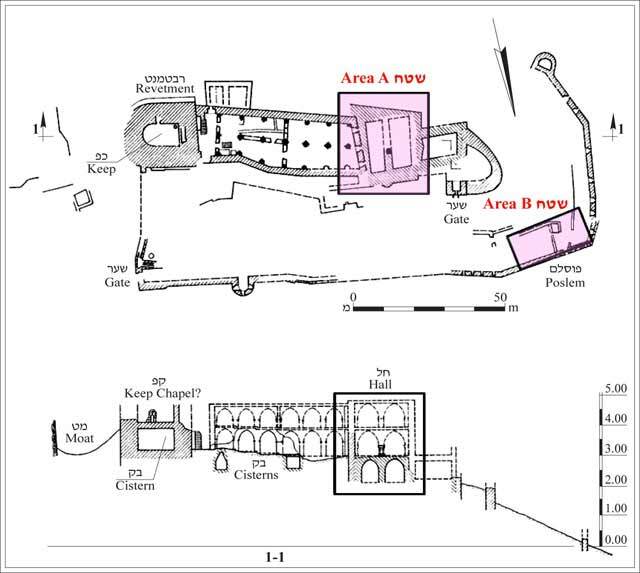 The excavation areas marked against the castle plan. 2. General view of excavation area, looking east. 5. Wall 1, looking south. 6. Stained glass fragment of a windowpane.